Perhaps Mel Brooks said it best in History of the World Part I: "It's good to be the king." Rhett Miller, front man for the Old 97's, basked in that feeling at the House of Blues Monday night. Miller, playing the part of a rock n' roll star, opened the show doing the hippy-hip-shake while belting out the first cut off their new album, aptly titled "King of all the World." The upbeat number was accompanied by enthusiastic screams and near swoons from the many 20-something ladies in attendance, proving that the King is alive and thriving in this boyishly-charming quartet from Dallas. The 97's, once considered royalty of the alternative-country scene, took their name from a 1950's Johnny Cash hit, "The Wreck of the Old 97," a story about a train conductor who lost his airbrakes, then his life, when he fell behind schedule and attempted to ride his engine too hard. Monday evening, led by their own conductor Miller, the 97's also pushed their engines to the max, but stayed on the tracks in an effort to prove that it is now (with a few exceptions) strictly rock n' roll that stokes their fire. Instead of concentrating solely on new material from Satellite Rides, a good quality album displaying various shades of rock n' roll, the 97's song-list focused on every hollering, head-bopping tune they ever recorded. The rockin', rattling pace was largely appreciated by the 97's core audience of post-slacker hip-kats, many of whom discovered the band after their break-out smash hit "Murder (or a Heart Attack)" off the 1999 Fight Songs album. But what is good for the conductor is not always good for the passengers. The 97's have often been accused of leaving their lamenting, alt-country fans behind in an attempt to break on through to the other side. Commercially speaking, no one can blame them for changing tracks, although only time will tell if their train arrives in the pop-sensation station. In their determination, the band's strive for rock n' roll acceptance was a little overdone and obtrusive. It was as if they were pandering to every recording bigwig in Hollywood, flashing a big neon sign, advertising that they belong in the pantheon of greats which have come before them. Their engine roared so steadily, and their brows were so lathered, that rarely was there a moment for a breath, or a display of a different shade to add range to the show. Miller himself looked like he was trying to personify a "god-like creature" and came off as a faux-Jim Morrison. Perhaps one less hip-shake, wink to the girls in the peanut gallery, toss of his hair, or Pete Townshend windmill strums, and the band's fine musical direction could have spoken for itself. When the king is constantly reminding his subjects that he is the ruler, he risks losing the credibility that his voice already carries. 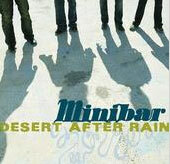 Opening the show, and exemplifying the exact opposite, were the alternative rockers Minibar, originally out of Great Britain. This appealing, musically-skilled foursome let their infectious, diverse blend of rock and ballads do the talking...less fluff, more filling...and charismatic, front man Simon Petty's (no relation) humility only added to the refreshing display of camaraderie that these "gee-whiz we're just happy to be here" kids exhibited. With their melodious, skilled debut album Road Movies as proof, these are four lads that we could be hearing a lot more from.